* I received an electronic copy of this book directly from the author to facilitate my review. Have you heard of JC Little yet? She's The Animated Woman. And her drawings are rock-yer-socks awesome. Seriously. All you need to do is head on over to her website to see just how talented she is. And what's amazing about this book - beyond the sentiment and the artistry - is that there are no written words. That's right. Not a one. So how, pray tell, is this an actual book? You might ask this. You wouldn't need to once you saw it, but you might anyway. Beforehand. This is such a book that as I scrolled through each page my heart swelled. Look at the cover image. This mother? Her heart is outside of her body. Any mother knows this feeling. Any mother knows what it's like to find that your heart is moving, growing, getting themselves into sticky situations, while you - the mom - sit back and can really only watch. And support. And love. This book is all of that and more. It's the perfect Mother's Day gift for any mom you know. Your mom. Your daughter (yes, even your young daughter would appreciate this book). Your grandmother. Aunts. Sisters. It's really beautiful and just so real. I'm honored to have had the opportunity to read and review this book. I promise you'll be happy that you bought it, even if you have to buy it for yourself. You totally need a copy today. Happy Mother's Day to you! You can buy your hard copy on Amazon by clicking the book cover below. 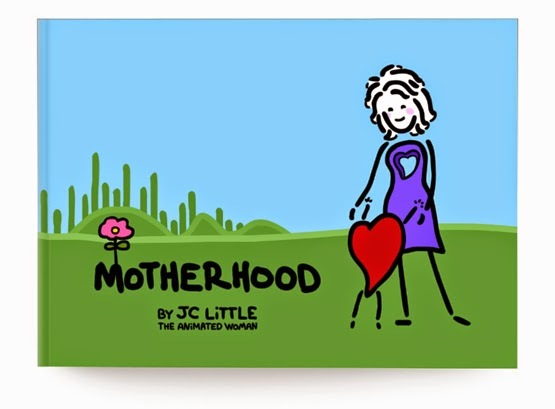 Or your Kindle copy by clicking JC Little: Motherhood. This would a great mom's day gift. so proud of JC. :) great idea for a gift for mom! Sometimes there are no words for what I feel, as a mother...possibly because they're stuck in my throat. Thank-you so much for this wonderful review Andrea.